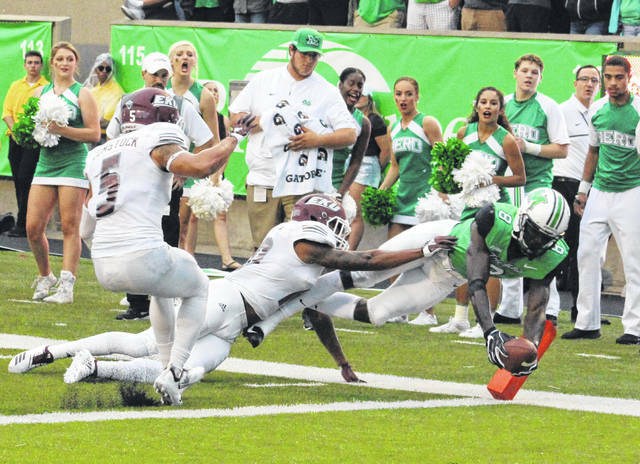 Marshall wideout Tyre Brady successfully dives for a touchdown during a Sept. 8 football contest against Eastern Kentucky at Joan C. Edwards Stadium in Huntington, W.Va.
HUNTINGTON, W.Va. — Marshall had 11 players chosen to the 2018 All-Conference USA football teams, as voted on by the coaches within the East and West divisions. 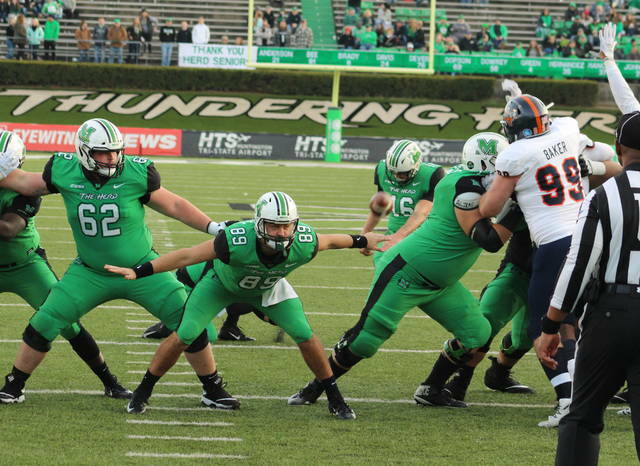 The Thundering Herd (8-4) tied Florida International with a 6-2 mark in CUSA East Division play, forcing a two-way tie for the runner-up spot. Middle Tennessee won the East Division with a 7-1 record. MU had four first-team selections and another three picks apiece in the second team and honorable mention ranks, plus had one freshman come away with a share of a pretty high accolade. Wide receiver Tyre Brady earned first team honors for a second consecutive postseason, while offensive lineman Levi Brown and defensive back Malik Gant — a pair of second team selections a year ago — earned first team accolades. Matt Beardall was also a first team honoree as a long-snapper. Defensive linemen Ryan Bee and Ty Tyler were second team selections, as was defensive back Chris Jackson. 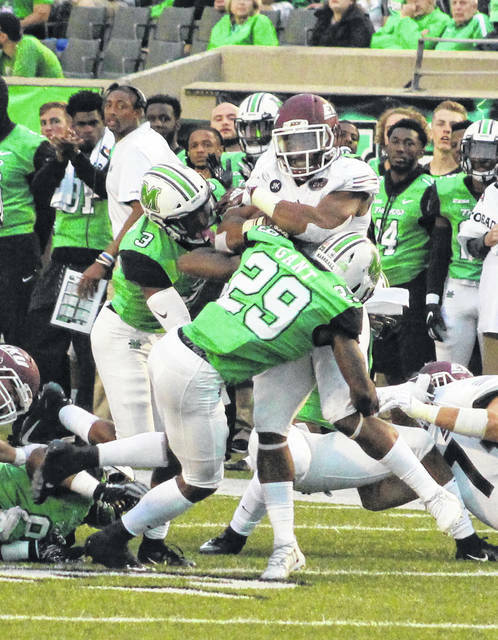 Tight end Armani Levias, wideout Marcel Williams and linebacker Chase Hancock were honorable mention choices on behalf of the Herd. Quarterback Isaiah Green shared Freshman of the Year honors with Florida Atlantic quarterback Chris Robison. Brent Stockstill of Middle Tennessee State was named the CUSA Most Valuable Player, while Mason Fine of North Texas was the Offensive Player of the Year. Jaylon Ferguson of Louisiana Tech was the Defensive Player of the Year. Rick Stockstill of MTSU was chosen as the CUSA Coach of the Year and Jack Fox of Rice was the Special Teams Player of the Year. James Morgan of Florida International was named the conference’s top newcomer. West Division champion Alabama-Birmingham won the Conference USA championship with a 27-25 decision at MTSU. Marshall will face South Florida (7-5) in the 2018 Bad Boy Mowers Gasparilla Bowl at Raymond James Stadium in Tampa, Fla. The game is scheduled for 8 p.m. Thursday, Dec. 20. RB: Devin Singletary, FAU; Spencer Brown, UAB. OL: Reggie Bain, FAU; O’Shea Dugas, La. Tech; Levi Brown, Marshall; Chandler Brewer, MTSU; Justice Powers, UAB. WR: Tyre Brady, Marshall; Rico Bussey, N. Texas; Quez Watkins, S. Miss..
DL: Alex Highsmith, Charlotte; Jaylon Ferguson, La. Tech; LaDarius Hamilton, N. Texas; Oshane Ximines, ODU; Jacques Turner, S. Miss..
LB: Sage Lewis, FIU; Darius Harris, MTSU; EJ Ejiya, N. Texas. DB: Amik Robertson, La. Tech; Malik Gant, Marshall; Reed Blankenship, MTSU; Kemon Hall, N. Texas. K: Cole Hedlund, N. Texas. QB: Mason Fine, N. Texas. RB: Benny LeMay, Charlotte; DeAndre Torrey, N. Texas. OL: Nate Davis, Charlotte; Jordan Budwig, FIU; Rishard Cook, UAB; James Davis, UAB; Malique Johnson, UAB; Miles Pate, WKU. WR: Adrian Hardy, La. Tech; Jonathan Duhart, ODU; Travis Fulgham, ODU. DL: Ryan Bee, Marshall; Ty Tyler, Marshall; Jamell Garcia-Williams, UAB; Anthony Rush, UAB. LB: Juwan Foggie, Charlotte; Khalil Brooks, MTSU; A.J. Hotchkins, UTEP. DB: Jalen Young, FAU; Chris Jackson, Marshall; Wesley Bush, MTSU; Nate Brooks, N. Texas; Ky’el Hemby, S. Miss..
K: Jonathan Cruz, Charlotte; Parker Shaunfield, S. Miss..
QB: James Morgan, FIU; J’Mar Smith, La. Tech; Blake LaRussa, ODU. RB: Anthony Jones, FIU; Kerrith Whyte, FAU; Jaqwis Dancy, La. Tech; Austin Walter, Rice; Winston Dimel, UTEP. OL: Dallas Connell, FIU; D’Ante Demery, FIU; Shane McGough, FIU; Brandon Walton, FAU; Ethan Reed, La. Tech; Michael Rodriguez, La. Tech; Kody Russey, La. Tech; Robert Behanan, MTSU; Josh Fannin, MTSU; Manase Mose, N. Texas; Sosaia Mose, N. Texas; Sam Pierce, Rice; Arvin Fletcher, S. Miss. ; Bobby DeHaro, UTEP. TE: Chris Phillips, Charlotte; Armani Levias, Marshall; Jay’shawn Washington, S. Miss. ; David Lucero, UTEP. WR: Austin Maloney FIU; Jovon Durante, FAU; Teddy Veal, La. Tech; Marcel Williams, Marshall; Ty Lee, MTSU; Aaron Cephus, Rice; Austin Trammell, Rice; Tim Jones, S. Miss. ; Xavier Ubosi, UAB; Lucky Jackson, WKU. DL: Tyriq Harris, Charlotte; Noah Curtis, FIU; Anthony Johnson, FIU; Jordan Bradford, La. Tech; Immanuel Turner, La. Tech; Jahmal Jones, MTSU; Malik Manciel, MTSU; Rakavian Poydras, MTSU; Zach Abercrumbia, Rice; Roe Wilkins, Rice; LaDarius Harris, S. Miss. ; Garrett Marino, UAB; Quindarius Thagard, UAB; Chris Richardson, UTEP; Kevin Strong, UTSA; Juwuan Jones, WKU; DeAngelo Malone, WKU. LB: Rashad Smith, FAU; Collin Scott, La. Tech; Chase Hancock, Marshall; DQ Thomas, MTSU; Brandon Garner, N. Texas; Anthony Ekpe, Rice; Racheem Boothe, S. Miss. ; Sherrod Ruff, S. Miss. ; Chris Woolbright, UAB; Jamar Smith, UTEP; Josiah Tauaefa, UTSA; Ben Holt, WKU; Masai Whyte, WKU. DB: Ben DeLuca, Charlotte; Richard Dames, FIU; Stantley Thomas-Oliver, FIU; Shelton Lewis, FAU; James Jackson, La. Tech; L’Jarius Sneed, La. Tech; Darryl Randolph, MTSU; Khairi Muhammad, N. Texas; Picasso Nelson, S. Miss. ; Ty Williams, S. Miss. ; Mar’Sean Diggs, UAB; Brontae Harris, UAB; Broderick Thomas, UAB; Nik Needham, UTEP; C.J. Levine, UTSA; Ta’Corian Darden, WKU; Drell Greene, WKU; Devon Key, WKU. K: Jose Borregales, FIU; Bailey Hale, La. Tech; Hayden Tabola, Rice; Jared Sackett, UTSA. P: Matt Bonadies, MTSU; Alvin Kenworthy, N. Texas; Mitchell Crawford, UTEP; Yannis Routsas, UTSA. KR: Austin Maloney, FIU; DeAndre Torrey, N. Texas; Austin Walter, Rice. PR: Teddy Veal, La. Tech; Keegan Brewer, N. Texas. LS: – Tommy Zotus, FIU; Reeves Blankenship, La. Tech; Nate Durham, N. Texas.